RDS MAX 3.0 is the latest in line of our RDS encoders. It combines the accumulated knowledge and experience gathered with RDS MAX v1.0 and 2.0 and brings new enhanced features, smaller size and increased reliability. RDS MAX 3.0 scrolls PS faster than previous versions and supports more than 3 times as many PS, more than you'll ever need. Compatibility with any RDS tuner out there is guaranteed. RDS MAX 30 can also pick up MP3 ID tag from Winamp and transmit it as PS or radiotext on your RDS-enabled receiver. PS scrolling is supported as well. Jazzler support is coming soon, too. In short, if you're using your PC and WinAmp or Jazzler to play your audio over the transmitter, now you'll finally be able to send the song and artist name to your listeners! Among other features are dynamic PS (also in stand alone mode, without a PC), PTY, TA, RT, CT, ECC, EON and others. 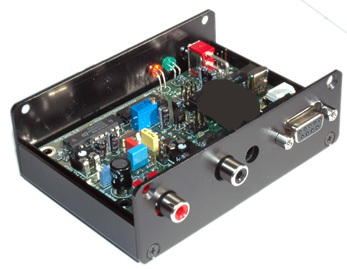 RDS MAX comes with MPX feedthrough function, meaning all you have to do is connect it between the stereo encoder and the transmitter. 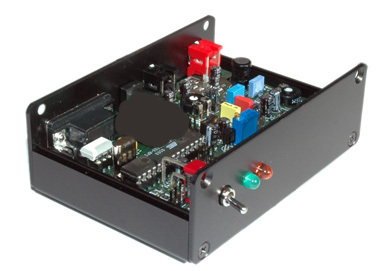 New enhanced PLL circuit makes it easy to lock RDS MAX 30 to stereo pilot. Suitable RCA connectors are already on the PCB board. Connection to the PC is via standard RS232 cable. New black anodized enclosure is smaller, looks better and is more convenient to use. External TA switch makes it easy to switch to TA even without a PC, in stand-alone mode. - If you have RDS MAX 2.0 already, you're eligible for a upgrade rebate, making it possible to purchase RDS MAX 30 cheaper. Included program supports all Windows flavours! Jazzler support coming soon. Unit can also work independently from the PC. Linux driver is under development! If you want to play with the windows driver, a basic version is included on the installation CD so you can start immediately (it is written in Visual Basic). Entire protocol has been simplified and is now really easy to use. The X-RDS PROFESSIONAL SYSTEM has all the features you would ever need from an RDS encoder and at a fantastic price. Supports scrolling text and timed text lists. You can program up to 8000 charachters of programme service name information into the encoder to provide you with a whole wealth of text transmission possibilities. Programming is simple with the supplied windows program which can be used directly or remotely via satellite. All RDS groups are supported including 'real-time' time and date. The RDS encoder provides a full loopthrough interface for connection to your existing broadcast chain. Now with RS232 cable included! !